The 10th Annual Veteran’s Resource Fair, September 4th, was attended by over 75 non-profit and governmental veteran-serving agencies. The event featured a housing/homeless resource panel. Orange County Board of Supervisor Lisa Bartlett awarded the college a resolution for 10 years of such a meaningful event and also commended faculty member Terence Nelson with a resolution for his dedication to our local veterans. 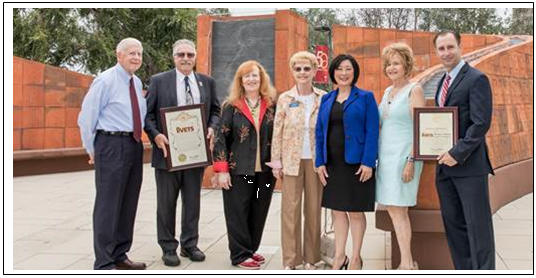 Pictured left to right: Trustee Jim Wright, Saddleback College Interim President Jim Buysse, Chancellor Kathleen Burke, Community member Joyce Van Schaack, OC Supervisor Lisa Bartlett, Trustee Marcia Milchiker, and Saddleback College VETS Program Coordinator Terence Nelson. Trustee Jay thanked everyone who worked so hard to make the Saddleback College 50th Anniversary so wonderful. She particularly enjoyed meeting up with retired colleagues, faculty and staff. She also enjoyed playing the games at the BBQ. President Jemal stated that he was unable to attend the Saddleback College BBQ celebration but heard nothing but wonderful reviews. Saddleback is a special place and is one of the best colleges in the state and the nation. Trustee Lang congratulated the College President and staff on Saddleback College’s 50th anniversary and everyone who works diligently to sustain the College’s outstanding reputation. Trustee Milchiker reported that she and Chancellor Burke attended the Orange County Community Colleges Legislative Task Force on September 13. The meeting was hosted by the Coast Community College District. She announced that she attended the International Debate Showcase at IVC where debaters from IVC debated a delegation of Rwandan students. The debate was judged to be a tie. Thanks to Professors Gary Rybold, Professor Bill Neeson and the debate team staff. Trustee Milchiker also commented on attending the Saddleback College’s 50th Anniversary Celebration and enjoyed the cake cutting, photo opps, engagement booths and seeing so many retired faculty and staff. Trustee Prendergast echoed comments by other Trustees congratulating Saddleback College on their 50th anniversary. Trustee Whitt stated that she has spent more than three quarters of her life at Saddleback College and loves it more today than at any other time. Reminded everyone to be sure to have fun while attending and working at Saddleback. She also mentioned that she visited the Library today and found that there is a vending machine for low-income students to receive food at no charge. Trustee Wright commented that he had the honor of leading the pledge of allegiance at the recent Veterans event. He also attended recent Saddleback College Football Games. He also attended the Saddleback College Celebratory event and enjoyed it immensely. Lastly, he congratulated Saddleback College for receiving a prestigious national science award. Student Trustee Hoang also congratulated Saddleback College on its Anniversary. On September 21, she attended a leadership workshop and learned about resources that the Equity Program offers. Upcoming, she is working with Saddleback and IVC student leadership to schedule monthly forums at both campuses. Associated Student Government Presidents’ reports: Irvine Valley College ASG President Matthew Rosborough congratulated Saddleback on its 50th Anniversary celebration. ASIVC Written Report. Saddleback College ASG President Perry Meade was absent. Welcomed the following new faculty and staff: Lizzet Bobadilla, Counselor at IVC; Sanja Apodac, Laboratory Assistant, Saddleback College; Monserat Arango, District Financial Aid Specialist; Kristin Duggins, Manager, office of the Chancellor and Trustee Services; Melissa Louise Francke, District Admissions and Records Specialist; Julian Violeta Kavazov, Financial Aid Specialist; Matthew Lamason, Network Systems Technician, Saddleback College; Cecilia Gaye Ray, District Senior Accounting Specialist. The board meeting may be viewed online at www.socccd.edu. Television broadcasts are scheduled for 7 pm on Friday, September 28 and Saturday, September 29 on SC Channel 39 and IVC Channel 33. SC TV 39 has an additional broadcast on Sunday, September 30 at 7 pm.